This Zombiephile has been killin’ zombies again. Lots of them. And it feels really, really good. Resident Evil: The Umbrella Chronicles, released last month and available only on the Nintendo Wii console, is an injection of zombie-slaying goodness directly into the Wii console, and it’s much appreciated. Doubtless the best shooter on the Wii console since Metroid, Resident Evil: The Umbrella Chronicles succeeds in so many ways that it’s hard to distill just five reasons: but distill we have. Capcom has returned truly awful voice acting to the Resident Evil franchise. Anyone who played the old RE games remembers that the voice acting in the first three Resident Evil titles was absolutely terrible, zero inflection, complete disregard for context and personality, real rubbish. Playing TUC almost feels like Capcom went and dug the old voice actors out of the closet to remake some of the most wonderful moments in improbably bad dialogue that we’ve ever experienced. Kudos. The Umbrella Chronicles lets you relive some of the RE games’ greatest (and scariest) moments, from a perspective that actually makes sense. We don’t mean that the plot makes sense; that’s still total garbage; we mean that the perspective of the game makes sense – you can actually aim for the head now. The overhead, cinematic camera style of the previous RE games meant it was impossible to get that most satisfying of zombie kills – the head shot. TUC puts the old RE games into a fast-paced, first-person perspective that keeps you drooling for more. The Zombies really look like Zombies. Seriously – it’s kind of scary when they come chomping at you and you can’t get a head shot because they keep swaying from side to side with their heads hung back. These zombies are truly frightening – they come out of nowhere, they grab, bite and generally lurch toward you, occasionally offering terrifying bursts of speed, and they really look pretty putrid. Even though there’s only about eight zombie models in the whole game, somehow you just don’t mind shooting the same zombies over and over. Especially the one that’s dressed like a stewardess – she’s kind of hot. TUC’s scoring system rewards players for mayhem. At the end of each level, players are scored based on their performance – how many enemies killed, critical hits (head shots), secrets discovered, and, our favorite, objects destroyed. That’s right – the game actually rewards you for destroying random objects that have no actual purpose. Now, that might not sound like too much fun to you, but what it means is that your trip down memory lane will be studded with the silly, meaningless utter destruction of every breakable object you come across – and they give you a lot of them. 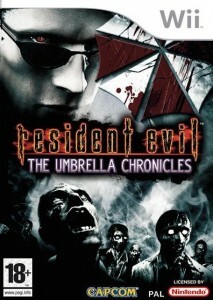 Resident Evil: The Umbrella Chronicles will help you train your girlfriend in advance of the coming zombie apocalypse. C’mon, zombiephiles, we all know the outbreak is imminent – is your girlfriend ready? Our girlfriend is, thanks to The Umbrella Chronicles. After just ten seconds of fumbling with the Wii blaster, she put five bullets through five zombie heads – in a row. Thanks to TUC’s two-player functionality, “putting your target reticule over mine” and “killing my zombie” have just been added to our long list of relationship no-no’s. What better way to make sure your girlfriend is ready on Z-Day than to get her a Nintendo Wii and a copy of The Umbrella Chronicles?